The notorious Stanley "Tookie" Williams was executed by lethal injection this week. We condemn the public hangings in Riyadh but are we any better. Can taking a life in anger and vengeance alleviate the pain, loss, suffering and anguish of losing a loved one. 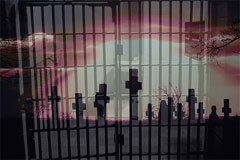 Is killing a relief of bereavement or does it create more horror. "Thou shalt not kill" so many laws are built on the tenants of faith, but how does it work that the punishment for killing is killing? It hasn't worked in over 2000 years so why would it start working now? Is there a better way?